Seti Afoa of Samoa Events announced the nominees for the Samoa Events Male Athlete of the Year that included two ocean swimmers Voting will open next week using a Monkey Survey link. 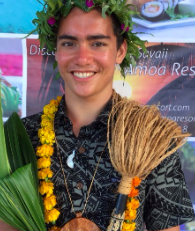 Sitivi So'oa'emalelagi, a 17-year-old Samoan from Vailele, participated in the 22.3 km Apolima Strait Swim from Upolu to Savai'i in 5 hours 37 minutes to become not only the younger person to complete a crossing of the channel, but also became its overall champion at the age of 16. Ray Winstanley, a 31-year-old living in Tasmania, Australia is also up for the honor. He won the 5 km and 10 km races at the 2017 Pacific Open Water Challenge as well as the Samoa Swim Series that included three 4 km ocean swims over 3 days.